Depending on which payment method you have saved in your "Payment Preferences," we will automatically charge your TuneCore balance, stored credit card, or Paypal account to renew your subscription. For your convenience, we will always try your TuneCore balance first (unless you checked off the button to not try your balance) and take what the balance can cover (must be at least 1 release). If there is still a remaining amount due, we will take that from your stored credit card or Paypal account. 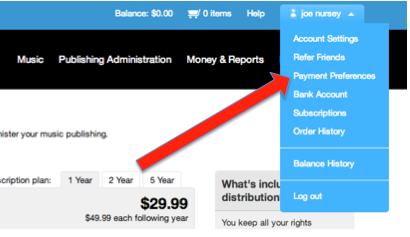 To go to your "payment preferences" click the drop down on the upper right of screen by your name. If you want to disable the auto-renewal feature on your account so that you can pay manually, please submit your request from the email address registered to your TuneCore account.